MATRIC personnel have a wide range of experience in catalysis, including the development and testing of catalysts, both homogeneous and heterogeneous. The processes involved include hydrogenation, hydroformylation, oligomerization/polymerization of olefins, selective olefin oxidation, condensation reactions, alkoxylation, and others. Test facilities include stirred autoclaves ranging in size from 300 mL to 10 gallons, a variety of fixed bed tubular reactors, and a collection of Berty reactors. Some of these units are connected to a process control system for automated control and data collection. In addition, reaction engineering expertise is available within MATRIC to assist in specifying the appropriate reaction parameters. Construction of catalyst test facility for quick performance validation of heterogeneous catalysts before introduction into commercial operation. Design, construction, and operation of an automated catalyst test unit to examine the effects of reaction conditions on a partial oxidation process. 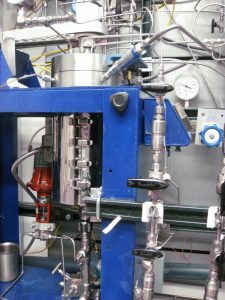 Construction and operation of a continuous catalyst test unit with catalyst recycle to evaluate catalyst performance and life. Preparation of novel heterogeneous catalysts for an oxidation process. Testing novel homogeneous catalysts for an alkoxylation process. Evaluation of heterogeneous hydrogenation catalysts in slurry and fixed-bed operation. Development and operation of a catalytic process using a series of continuous stirred-tank reactors. MATRIC is capable of catalysis projects ranging in size from small lab-scale reactions to large pilot scale operations.